MUPRINT will soon have a new neighbour! 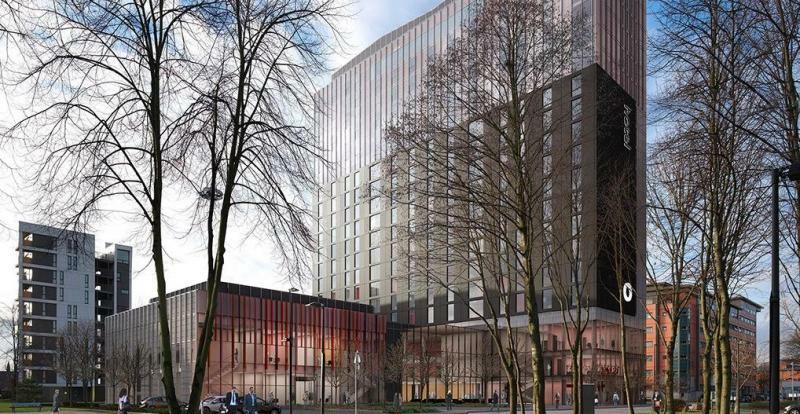 Work has re-started on a 19 storey hotel offering 234 hotel bedrooms and 100 suites a stone’s throw away from MuPrint on the University of Manchester campus at the junction of Booth Street West and Higher Cambridge Street. The new building includes a restaurant and breakfast zone, bar, offices, gym and conference facilities. A two-storey Executive Education teaching space associated with Manchester Business School is also planned. So before the paint is dry on the new Manchester Metropolitan University (MMU) Student Union on the adjoining block, another new university building will be well on its way, changing the skyline around MuPrint once again. “So much has changed since MuPrint arrived here in 2011. We have much better pedestrian access, a loading area right outside the shop and new buildings popping up every few months – this part of Manchester feels a little bit like Manhattan island now, such is the rate of building progress,” commented a MuPrint spokesman. Other recently completed buildings in the area include MMU’s new Business School which opened its doors in September 2012 and won a Building of the Year award. Also MMU’s Birley Fields project which represented the final stage of MMU’s plan to consolidate the University from seven campus locations to two was completed in 2014. The new University of Manchester business school hotel was designed by architects BDP and Leach Rhodes Walker and will provide high-end accommodation for visitors to the city and a new home for the business school’s corporate leadership and management programmes under a contract worth as much as £40m.